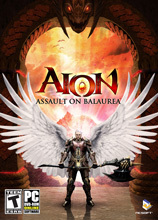 <br>Aion: Assault on Balaurea (Aion 2.0) evolves the game's story and terrain as it expands the game world of Atreia far beyond the traditional territories of Asmodae and Elysea. In this new chapter of Aion, characters take the fight against the invading Balaur into Balaurea, the Balaur's homeland, through a counterassault against that massive, dragonlike enemy race and its allies. Aion: Assault on Balaurea will leave players breathless as they encounter jaw-dropping new challenges, novel and updated instances and zones, an increased level cap, and fresh weapons, items, skills, and flight mechanics. And characters will not be exploring the new zones all by themselves, as Aion: Assault on Balaurea introduces functional pets equipped with in-game benefits that will rapidly become constant character companions.